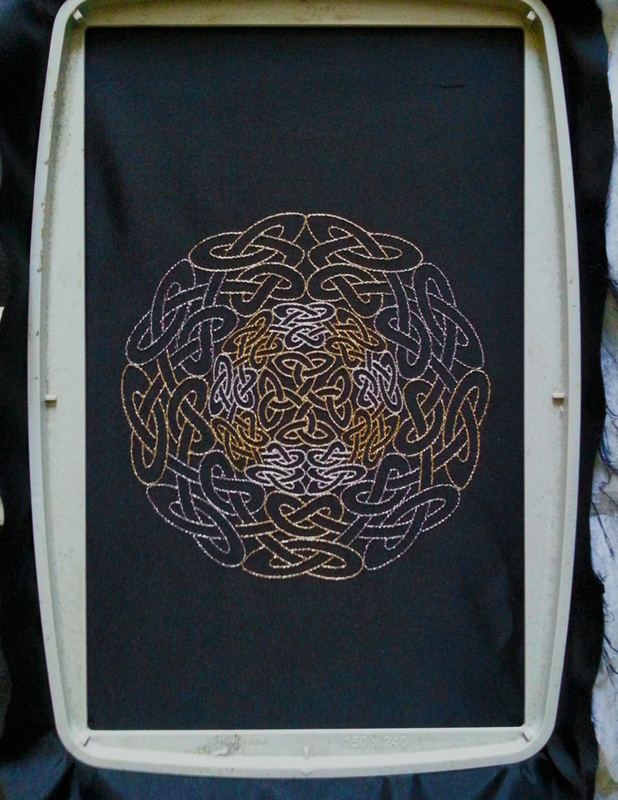 This is a simple Celtic running stitch design utilizing a nine fold radial symmetry. This is a five color design in one size of 14.6 by 14.6 cm at 9190 stitches approx. Madeira metallic threads ( gold 3, gold 6, aluminium and silver were used to give a sparkled eye catching look. I used a running point pitch of 1.7 mm ( outer ) and 1.3 mm ( inner ) with a schmetz top stitch needle. I also used gold and light blue under-stitch. A Light stabilizer and touch of 505 fabric adhesive were also used. Love this design, thank you. Waiting on your next version. I have used your first version for years and totally love it. I will spread the news about your upcoming version 2. I am anxiously awaiting your new build. I think it is much more user friendly than the crazy singer software that came with my machine. This absolutely amazing! Happened across your site by Google search and will return regularly – can’t wait for Sophie 2.0. Please keep up the inspirational work! Am off to make a donation and I have to tell you I am not often impressed enough to that! Will spread the word.